ESB was a project many years in the making but didn’t take tangible form until 2016. The only sanctuary for elephants in Latin America is situated on 2800-acres of incredibly diverse property in the municipality of Chapada dos Guimarães, Brazil. ESB isn’t developed with an altruistic view of what sanctuary should be, but instead is guided by the elephants of our past. They allowed us to be part of their lives and taught us what elephants need to heal from the darkest of traumas. Out of respect for what they have shared, we carry that forward with the elephants of today and the future. Elephant Sanctuary Brazil currently has three resident elephants, Maia, Guida, and Rana. They are living in the Asian female elephant habitat, currently awaiting new friends. The intention of the sanctuary is to house elephants of both species and gender. Each species will have their own habitat (due to issues with cross-species socialization) and the males of each species will be housed separately from the females. Future plans include integrations of males with females when disposition allows and a safe method of birth control can be implemented. Males will be housed together with the ability to separate if there is conflict and a reinforced musth corral (50 acres) will be built in case it is needed during times of hormonal spikes. At this early stage, the amount of elephants we rescue is contingent upon the space developed for them. The Asian female habitat is near completion for the initial 4-6 elephants, but construction on the female African habitat has just begun. ESB’s development is solely dependent upon funds raised. The sooner we can build, the sooner more elephants come home to sanctuary. You can check the status of our current rescue progress and construction progress. 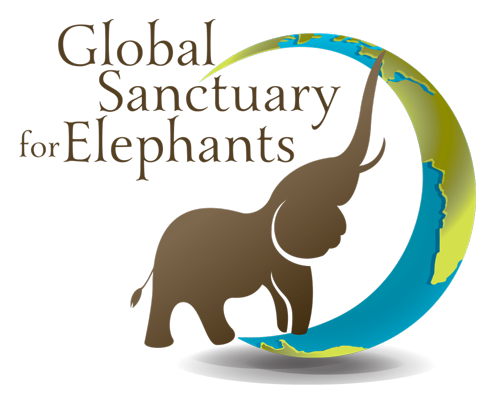 At any elephant sanctuary created by GSE, we will always plan for the worst, but hope for the best. What this means is we ensure that the most damaged, defensive, aggressive or insecure elephant can thrive here. This is part of the reason we will not be open to the public. Sanctuary is their safe haven and for the first time in their lives, it is all about them. In order to be as vulnerable as necessary to heal emotionally, every elephant needs to feel safe. Long-term, trusting relationships with those around them ensures this. We will have volunteer opportunities in the future, but volunteers will not do anything hands-on with the elephants. This goes back to surrounding elephants with those they have built up relationships with. Instead, volunteers will be helping to provide for and build a future for the elephants. Elephants will be managed through protected contact: a barrier or significant space will be kept between caregivers and elephants. Caregiver safety isn’t the only consideration here, it also allows the elephants to feel they have their own space. Some elephants need this to let their guard down fully and feel secure. Positive reinforcement will be used for all training that is to take place. Due to the physical impact of captivity, elephants need to be medically managed: health checks, blood draw, and footwork are all part of the care needed. Most elephants in South America have never had training that wasn’t dominance based, so it will be a new concept for many. Instead of being punished when they don’t do something they are told, they will be rewarded for when they do something they are asked. GSE Co-founders Scott and Kat Blais live on grounds in order to ensure that every aspect of ESB is about the elephants. One of the most important foundations of sanctuary is that the caregivers respect elephants as an entire being: body, mind, and emotions. It takes many years to see all the nuances of such complex beings and decades of experience help to pass on that knowledge. Caregivers are more than staff that feeds and clean up after elephants, they are who the elephants look to for reassurance, they are the first ones to notice when something is wrong and their day is full of finding ways to nurture those under their care. To ensure the elephants’ comfort with medical procedures, we have a full-time veterinarian who also works as a caregiver. It’s hard for elephants to feel at ease when someone is only around them during negative experiences. Seeing their vet day in and out and forming a trusting relationship with them will make the elephants more comfortable when they do need medical care. Our vet also lives on grounds, so she is right here in case of an emergency. 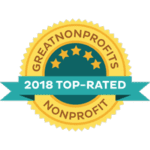 Along with our onsite veterinarian, GSE has a team of veterinarians with various specialties and elephant care experience from around the globe. Staff will apply a holistic approach to elephant health and well-being. By definition, this means that the physical, mental, social and emotional aspects of a being’s life are viewed as an integrated whole. This does not mean that traditional medicine won’t be used. The Cerrado of Mato Grosso, the biome in which the sanctuary exists, is home to a total of 509 species of medicinal flora. From elephants we have cared for in the past, we know elephants seem to have an innate knowledge of plants and their medicinal properties, even when they are new to the region. Several members of our staff and neighbors have an extensive knowledge of plant use that has been passed down through generations. We look forward to watching what the elephants consume and seeing if they offer hints to possible issues and if they indeed self-medicate. There isn’t one single thing that nature hasn’t provided this piece of paradise with. It’s not just streams, ponds, trees and grass; it’s a mix of soft, waist-high natural grasses that beg to be touched and cultivated dark green pasture grass packed with nutrients. Springs that are so clean and fresh that four bottling companies reside in this little town. Streams and rivers that are big enough to bathe and play in, but small enough to not be overwhelming to older or sick elephants. Nooks and crannies to explore, steep hills for the adventurous girls or the big boys and gentle slopes for napping. Wonderful palms that provide food for macaws and countless other wildlife, mixed with numerous indigenous varieties of fruit trees and hardwoods that offer a 10-degree temperature drop once you enter the shade of their canopy. When you are on the property, all you hear is the birds and bugs and all you smell is fresh dirt and green foliage. It is pleasing to every one of the senses and phenomenal in every way. We have a long and exciting road ahead. 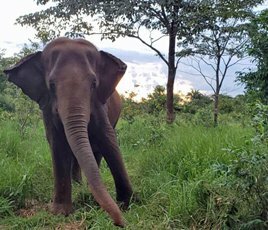 With ten elephants already on the waiting list, we look forward to developing more of the property, bringing more elephants home and sharing their healing journey that only sanctuary can provide with all of those who have helped make this haven possible.